We have good news and bad news. The bad news? Depending on who’s living in your house, you may have to wash your interior windows quite often. The good news? Cleaning interior windows is much easier than cleaning exterior ones! Check out some of Marcotte Glass’ tips and tricks to keeping your interior windows looking like shiny and new. 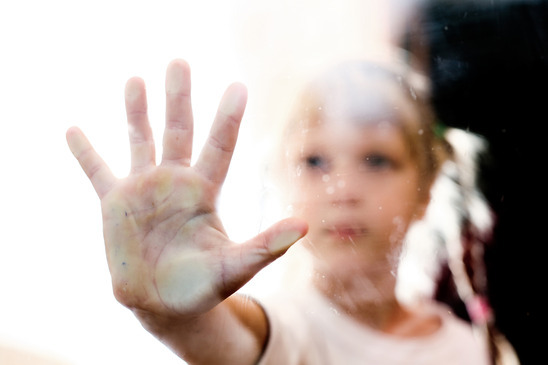 If you have animals or children running around your home, you can relate to the hundreds of hand smudges and nose prints you see on your windows on a daily basis. Cleaning your windows regularly will help prevent any build up from occurring and will keep the cleaning process quick and painless! Generally speaking, interior glass usually isn’t as dirty as exterior glass , so there is no need to wash the windows with anything more than a mixture of vinegar and warm water. However, there is an exception to this rule, and that exception is handprints. Handprints are grease, so they require some soap or detergent to remove. Once you take care of the grease, you can finish it off with the usual vinegar spray and squeegee routine. Similar to exterior windows, we don’t recommend cleaning the inside of your windows when the sun is shining on them. This will evaporate the spray before you have a chance to wipe it away, and will leave you with a streaky mess! After you’ve cleaned a window, take a thorough look at it from all angles. Crouch down, stand on your tippy toes and sway side to side to check for any streaks. If you do happen to see any smudges or streaks, simply take a clean rag and buff them away. If you get it right away, it won’t leave a mark! If you are noticing that your windows get dusty and dirty unusually fast it might be worth it to check the filters on your furnace and air conditioners. Modern homes are much more airtight than they used to be, which means that more dust, pollen, dirt, etc. is floating around and not escaping your home. Filters help to trap this dust and dirt and keep it from entering your appliances. If the filter is full, it can’t trap the dirt and it will end up getting re-circulated throughout your home. If you can’t see any light through the filter when holding it up to a light, then it’s time to replace it! Clean windows will not only improve the look of your home, but they will also help to maintain the quality of the window. Practice regularly cleaning your windows and you will see an extended lifespan, which means more money in your pocket! If you have any questions about how to care for your windows, contact the team at Marcotte Glass. Their knowledgeable staff is always ready to help.